A website that went online Tuesday has published a list of 200 IDF soldiers which it classifies as directly involved in operations carried out in Gaza during Operation Cast Lead. Each entry features the soldiers and officers' pictures and personal details, including identification numbers and addresses. "In underlining them we are purposefully directing attention to individuals rather than the static structures through which they operate," the website states while calling on visitors to spread the info "widely". The reliability of the information is as yet unclear. "Underlining the following people is an act of retribution and affront. They are the direct perpetrators, agents for the state of Israel that in Dec. - Jan. 2008- 2009 attacked scores of people in the besieged Gaza" noted the website. The website has no special design or graphics, just a table of names of soldiers listed in alphabetic order which the site claims, served in the army in the winter of 2008-2009. Soldiers listed include officers from the very top of the IDF hierarchy – Chief of Staff Gabi Ashkenazi and down to a sergeant in the infantry training program. "The people listed here held positions of command at the time of the attack therefore not only did they perform on behalf of a murderous state mechanism but actively encouraged other people to do the same. They bear a distinctive personal responsibility. They range from low-level field commanders to the highest echelons of the Israeli army. All took an active and direct role in the offensive," claimed the website. A website counter at the top of the page states that over 3000 people have viewed the website so far. They claim that the information "was received anonymously; presumably from a member of the Israeli Military". It seems that the information was collected via the internet, doubtlessly through extensive use of social networks. A quick search reveals that many of the pictures on the site, especially those of the younger low level soldiers, were taken from facebook profiles. "This information was pirated. We encourage people to seek out other such similar information, it is readily available in the public sphere and inside public officials' locked cabinets," they said. The person or group behind the website remains a mystery as does the level of exposure that the website receives. The reliability of the information displayed is also in question, since other than in the case of the senior officers listed, it is impossible to tell whether those listed even served in the IDF during Operation Cast Lead. "In underlining them we are purposefully directing attention to individuals rather than the static structures through which they operate. We are aligning people with actions. It is to these persons and others, like them, to which we must object and bring our plaints to bear upon", they further stated. The project organizers declare that "this is a form of resistance that can be effectively sustained for a long while". Visitors to the website are told that "this project for one, has only just begun, do your bit so that this virtual list may come to bear upon the physical". The manifest signs off by calling all web surfers to get involved and: "Disseminate widely". Ynet has discovered that many of the details appearing on the website are correct. The photos were taken from various news publications and social networks like facebok. The officers and soldiers aren't quite sure how their details got into the website's hands, but clarified that they were proud of their actions and happy to be included in the list. First Sergeant (res.) Ziv Danieli from Ramat Gan served in the 101 paratroopers regiment and received a regimental commander citation for his actions in Operation cast Lead after he extracted his wounded commander while under fire from Hamas militants. Danieli doesn't know where the website got his personal information from but he stressed that he had no problem with the website. "Enjoy it! Whoever wants to can talk to me, I'll share my phone number as well if they want it. I stand by everything I did in Operation Cast Lead; I have nothing to be ashamed of." Danieli thinks that Israeli sources are behind the site. "The same people that the State protects are those that go out against it; sadly the enemy is within, as if we didn't have enough problems from outside." He isn't worried about harassment: It doesn't scare me, it doesn't bother me, I have taken trips abroad and will continue to do so, and more than that, I would be happy to meet whoever is behind the site." Noam Kashivski who served as a deputy tank company commander was also surprised to see his picture and personal information on the website. "I don't know who these people are but I'm at peace with my actions," he told Ynet. "I guess they found some of the information illegally, my picture was taken from my facebook account," Kashivsky added and claimed that this was nothing more than a political attack: "The site lists no sources and no details are added, they just rushed to a conclusion that suited them." Kashivsky said that he was "happy and proud to be on the list next to honorable men and women," adding that he wouldn't change his ways because of the site. "I'm not afraid, and I won't avoid going abroad. The orders we received were all honorable and necessary, I have no regrets." The site which is operated through British servers has already raised furious responses. An Israeli organization called My Israel has already picked up the gauntlet – offering 10,000 shekels ($2,712) to "anyone who will present information that will lead to catching those responsible for the website calling IDF soldiers 'war criminals' and responsible for publishing their personal information." The IDF spokesman stated that the army "is distressed over the publication of the names and information of 200 officers and soldiers under the heading of 'war criminals' slandering them and their reputations without any concrete evidence whatsoever." The website was eventually removed for breaching user rights. 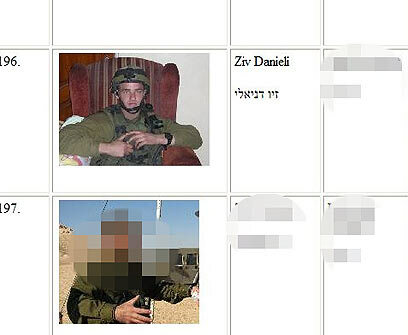 See all talkbacks "Site exposes IDF 'war criminals' "